One of Crusader Kings II’s best mods just got a little less fiddly. Elder Kings is a mod that turns the world of khans and popes into one filled with cat mayors and lizard barons. It’s been around since 2013 and the developers have long been tinkering with it, but playing an up-to-date version involved a bunch of irritating steps, not so much jumping through hoops as navigating some really annoying Oblivion gates. However, now playing a stable version of the mod is as easy as clicking a button on Steam workshop. Good. The mod runs through about 1600 years of lore and history, including the Interregnum, a period when every nation in Tamriel forgot to have a king or queen (whoops). It also encompasses the Alliance War, a big ruckus you might know from the battles of the Elder Scrolls Online. And there’s other bits of 2nd era fantasy history gleaned from the series’ trove of lore. For instance, the Stormcloak Rebellion of Skyrim is a planned addition. As for what your monarch gets up to, the mod lets you join guilds like the Thieves Guild, cast spells on your political opponents, become the Dragonborn, align yourself with handsome Daedric princes, and become Emperor of Tamriel. There’s also vampires and werewolves, who are immortal. Which feels a bit… cheaty? A lot of these sound like they’ll involve pop-up events, rather than baked-in mechanics, but stuff like joining the Fighter’s Guild and worshiping Daedra will make use of the factional and religious menus that have been added in later DLCs for the heir-murdering sim. If you want, you can see a nice man playing the mod here. You can find out more about the mod’s features on the wiki. Previously, to play the most solid up-to-date version you had to sign up to the Paradox forums, link your Steam account, use the mod maker’s own SVN development repository (basically a third-party tool that would download the mod files for you) then fiddle with save files and folders. There were other versions but getting one that was on par with the latest version of Crusader Kings 2 was a bit of a chore. Now it’s on Steam Workshop, compatible with version 2.8.3.2 of the main game. Or you can get the ZIP file here. 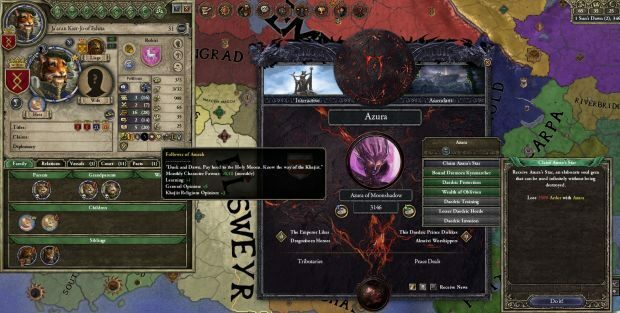 You don’t need any DLC to play it but the mod creators do recommend a whole bunch, including most of the big ones like The Old Gods, The Republic and Jade Dragon. Don’t like The Elder Scrolls? Well, I doubt you’ve read this far, but you could always try the Game of Thrones mod that turns the map of the world into Westeros.